The waistline of the dropped gown silhouette dips below the natural waistline and falls directly on the hips, adding curves and showcasing the natural female form. It lengthens the torso and helps to balance the upper and lower body. Flattering for many, both the fuller and the long, lean body types can wear this style. A wide range of necklines and fabrics work well. 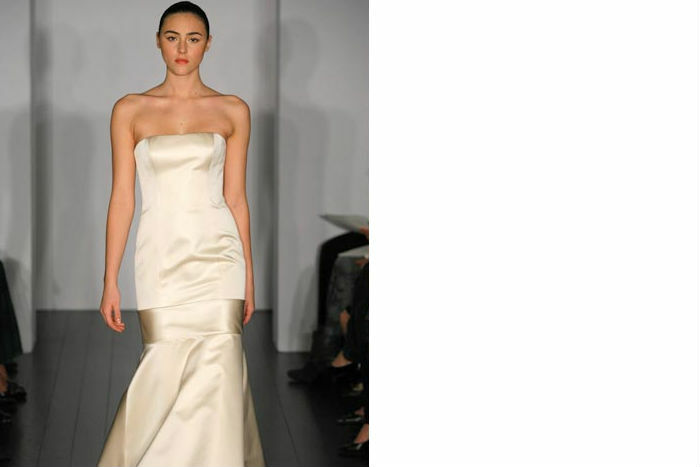 We especially adore Vera Wang’s use of appliques and tone-on-tone fabric. Ribbons and pleats also can create a more lush and original look. This shape is truly classic and sophisticated. Vera Wang and Priscilla of Boston show us the dropped waist look.